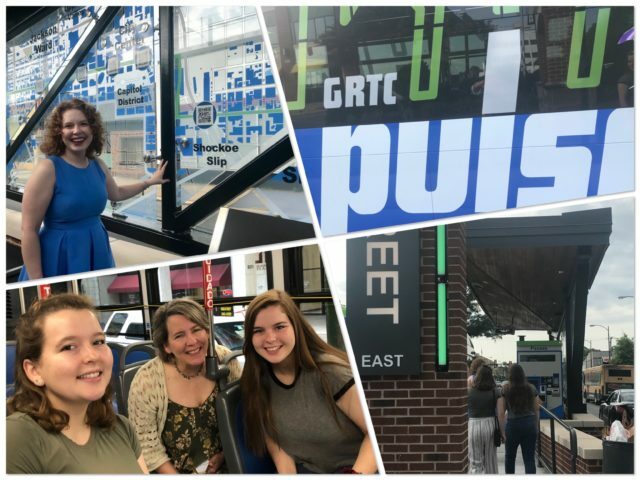 GRTC Pulse opened its doors to the public Sunday, June 24, 2018. The project is being completed in budget and on time with the contractual completion date of June 30, 2018. The fare to ride the Pulse is the same as local routes at $1.50 per ride or $0.75 for reduced fare customers. The Pulse is free to ride for CARE customers. To learn more about the Pulse and explore how to ride this new service, please visit: RideGRTC.com. GRTC Pulse is a modern, high capacity rapid transit system that serves a 7.6-mile route along Broad Street and Main Street, from Rocketts Landing in the City of Richmond to Willow Lawn in Henrico County. GRTC Pulse is jointly sponsored by Bon Secours Richmond Health System and VCU Health System. The Pulse links the public to many exciting destinations, businesses, services, and restaurants. Lane construction will continue with some remaining work as the service is in its integration period. With service now underway, drivers, cyclists and pedestrians are encouraged to pay close attention to traffic signage, lane markings and signalization. For everyone’s safety, please do not drive, bike, walk, or skateboard in Bus Only lanes. Bicyclists are welcome to use the Downtown bus only lanes between Fourth and Fourteenth Streets, and drivers are permitted to make right turns from these Downtown Bus Only lanes. Please yield to pedestrians in crosswalks. Pedestrians, please do not walk down the median; use sidewalks and marked crosswalks. Remain alert for Pulse buses and bus movements that may be different from neighboring lanes. The same day the Pulse service launches, significant transit improvements across Richmond also take effect for GRTC riders. The City of Richmond’s new network with all new routes, numbers and increased frequencies launches today. GRTC has teamed up with the City of Richmond to rework our area’s transit system through the Richmond Transit Network Plan – and the result will mean faster, more consistent service throughout the day, along with easier connections. Riders can also expect very similar service on weekdays and Saturdays with several new high-frequency bus routes north-south and east-west. These new City routes make it even easier to connect with the Pulse and reach destinations faster. The new City network lays the groundwork for us to keep serving this vibrant, growing region. To learn more about the new City routes, please visit TheGreatRichmondReroute.com. Several Henrico County service adjustments will also begin Pulse launch week on Monday, June 25, 2018. Enhanced weekday service every thirty minutes to Richmond International Airport, a major employer in Henrico’s East End, will be available on the Route 7 A/B Nine Mile Henrico. Taking advantage of the efficiency provided by the Pulse, the Route 19 Pemberton will offer more frequent service every thirty minutes between Willow Lawn and Pemberton and Broad. Also in the West End, Henrico’s new Route 79 Patterson/Parham will extend farther west to Quioccasin and Gaskin Roads at the Gayton Crossing Shopping Center. Additional Henrico County transit expansions are planned for fall 2018.